We steered our Pittaraks through a thin channel between the cliffs of a small rocky island and the mainland. A huge grounded ice berg partially blocked the narrow lead. To go around the island would add a couple more kilometres of paddling, so we opted to try and sneak by the grounded ice tower. The heaving swell burst against the glistening ice blue slick walls. Angus had the lead, the fastest of the three of us . We each paddled five-metre single kayaks, Angus and I in Pittaraks. 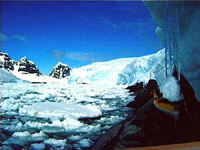 These were boats that two years before we had taken to the Antarctic peninsula. And kayaks we knew we could thoroughly rely upon for serious expedition paddling like South Georgia. Tentacles of kelp appeared on the surface, this meant the water was getting dangerously shallow and some of the larger rollers began exploding randomly about us. Between swells I would see Angus ahead, so tiny against the power engulfing us. I saw him surfing down a large roller, its crest starting to collapse into a booming foam. As the wave steeped Angus picked up too much speed. Already that day we had paddled a very hard and nervous six long hours. Now tired, he was slow to react. He broached on the steep crest and buried the kayak’s nose. He corkscrewed and cartwheeled as the wave broke over him. The next moment he was over, on his side, head in the freezing water. This I thought was the dreaded moment feared. We’re all on our own, as agreed. Though we were three, a rescue in such seas would be impossible. It would need be roll or….Angus foundered for a moment, the Pittarak’s high bow and stern keeping the kayak and him on it’s side rather than going completely upside down. Angus simply gave little more than a hard support stroke and he was up. We are all experienced kayakers and we’ve rolled kayaks between us thousands of times. But this was different – this was too real, too serious. The huge sea exploding about us, the water temperature hovering just above zero and the shore line an impenetrable cliff line. I remember being skeptical about Pittarak’s claim of being an almost ‘self righting’ kayak. But I had just seen a very timely demonstration and in that instance the crafts very clever design may have saved our lives. This was our second kayaking expedition to the Southern Ocean. Two years previously we had made the first unsupported kayaking expedition to Antarctica. Obviously equipment was a major concern to us on that expedition. We had a modest budget but needed to some how get the best kayak money could buy. Many sea kayaks had sprung onto the market but after searching about it seemed to me that the Pittarak was a good bow length ahead in thoughtful design. Now with two committing kayaking expeditions behind us and our Pittaraks, the wisdom of that decision and the boat’s intelligent design have become evident. Though a very sporty and responsive kayak, for the South Georgia expedition we were still able to load aboard enough food and equipment to travel self contained in a polar environment for some 50 days. The boat with its long keel-line tracks beautifully even in strong cross winds and keeps a steady course in rough choppy conditions. The recessed hatches offer little windage or wave resistance when paddling in waves. Our Pittaraks are left in storage in Chile and I look forward to more expeditions with them in the Southern Ocean.